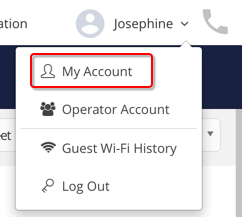 How to view and make changes to your Connect account. The My Account page shows some of your details as a system user including ‘Title’, ‘First name’, ‘Last name’, ‘Job Title’, ‘Telephone’ and ‘Email’, all of which can be edited. Here you can reset your password and upload or update a logo picture (a default will be used if you don’t upload a picture). 'Title’, ‘First name’, ‘Last name’, ‘Job Title’, ‘Telephone’ and ‘Email’ can all be updated within their own fields. 'Title' and 'Telephone' are optional fields so can be left blank. Clicking the password reset link will take you to the Change Password page. Here you will be asked to enter your current password, along with the new one, that you are asked to confirm. Make sure all changes are saved before you exit the page. The above profile picture is set as a default when joining Connect. You can upload a new one using the Browse button and clicking Upload when you have chosen a picture that is within the recommended dimensions. Ensure that all changes are saved before exiting the page.